President Muhammadu Buhari VS Atiku. Responsibility for ensuring a successful election falls on Nigeria's leaders, but international partners can make that outcome more likely. That shouldn't fool anyone though. These are crucial elections that could have serious consequences for Nigeria's stability. Firstly, indicators point to a tightly-contested race between Buhari and the main opposition's Atiku Abubakar, which could lead to disputed results. 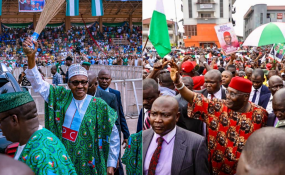 According to many Nigerian observers, Buhari enjoys the inherent benefits of incumbency and some built-in demographic advantages (his northwest base has the largest voter population among Nigeria's six geopolitical zones and he has a strong constituency in the country's southwest). But those assets could be outweighed by popular dissatisfaction with his record, notably around his 2015 campaign promises to improve security, bolster the economy and curb corruption. He has failed to end the Boko Haram insurgency, which has killed hundreds of security personnel in recent months, and there are security threats across many of Nigeria's 36 states. The president's economic record is equally disappointing. And, despite some strides, corruption remains widespread. Second, these same factors mean the elections will take place against a complicated backdrop. Widespread insecurity could dissuade potential voters and overstretch security forces. Boko Haram aside, violence comes in several shades: between herders and farmers in Nigeria's Middle Belt, which killed over 1,500 in 2018; from a surge of banditry in the northwest; and an epidemic of kidnappings for ransom across the nation. Economic misery likewise could have a deleterious political impact. 70% of Nigeria's estimated 200 million people live below the poverty line. Suffering from privation, a significant number of young people may be susceptible to recruitment by political operators ready to use violence and inflammatory rhetoric to intimidate opponents, disrupt the polls or dispute unfavourable results. Those young people come in numbers: Nigeria has one of the largest out-of-school populations in the world, comprising approximately 13 million children. And, after recession hit in 2016, youth unemployment rose to an unprecedented 33%. Third, candidates - not only at the presidential but also state level - are again approaching the vote with a win-or-die mindset, not least because of the generous financial rewards associated with political office. This raises the risk of a no-holds-barred contest that could involve large-scale vote-buying, rigging and significant violence. It is no surprise that the two major parties - the ruling All Progressives Congress (APC) and opposition People's Democratic Party (PDP) -- have persistently accused each other of planning to manipulate the polls and warned they would reject the outcome should that occur. The PDP has challenged the neutrality of both the Independent National Electoral Commission (INEC) and security agencies including the police. With intense acrimony and deep distrust, it is unclear how either party would respond to defeat. Primary responsibility for ensuring a successful election falls on the shoulders of Nigeria's political leaders, of course. But its international partners could make that outcome more likely. They could do this by strongly pushing Buhari and Atiku to make a last-minute joint pledge of non-violence and to pursue any post-election grievances through the courts, for example. But President Buhari should reinstate the suspended Chief Justice to ensure the courts' impartiality. They could also press Buhari to refrain from any further action that would jeopardise confidence in the electoral process. Or by setting up a standby arrangement for rapid mediation in the event of a major post-election crisis. Stakes are high for Nigeria and the region. A vote marred in controversy and violence inevitably would hinder efforts to address the country's security and economic challenges. A vote triggering instability would make it virtually impossible for Abuja to play a role commensurate to its potential on a continent in dire need of renewed leadership. Neither outcome is inevitable and, with steady leadership and international backing, both can be avoided.